newup | A package generator for the everything. A package generator for the everything. Built with PHP on top of a modified Laravel application and kernel. 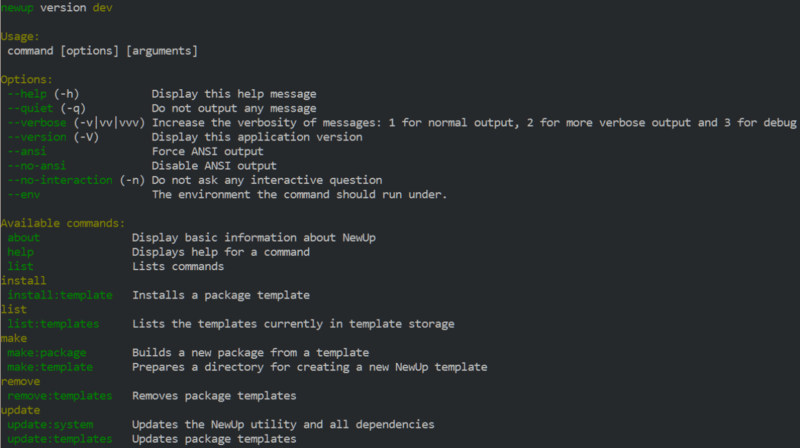 NewUp is a new PHP command line utility currently in development. The goal of the project is to be a global package generator for everything: frameworks, projects, etc. NewUp is also integrated with Composer - all package templates are packages and can be versioned and stored in any repository that Composer supports. NewUp also aims to be customizable. Instead of simply copying pre-built directory structures, template authors can make their templates dynamic and respond to environmental changes. NewUp is currently in active development, and there is a lot to be done. That being said, all incremental changes are being made available on GitHub. Interested in the project? Watch the repository to get notifications of updates, changes, etc. NewUp is open source software, made available under the MIT license and is hosted publicly on GitHub. © Copyright Johnathon Koster. NewUp is open source software, available under the MIT license.